Huddled over binder after binder filled with Yangtze river tours, maps and price tags in the lobby of my Chengdu hostel, I knew a typical “Yangtze River Cruise” just wasn’t for me. The two Montreal backpackers I’d met that were sitting with me agreed. It seemed all too expensive, too long, too much. The Yangtze, which runs west to east is one of the longest rivers in the world and the most significant in China. If I wanted to stick with my legitimate tour of the Mainland, I had to cross this iconic Yangtze somehow. The river also led to a bunch of provinces in the middle and back east that I’d yet to see, so I really had no choice. The other Montrealers opted for the popular overnight Chengdu-Xi’an train and let that route take them east to Beijing. I did things my way. So I waited until Chongqing where I asked the hostel staff for help. 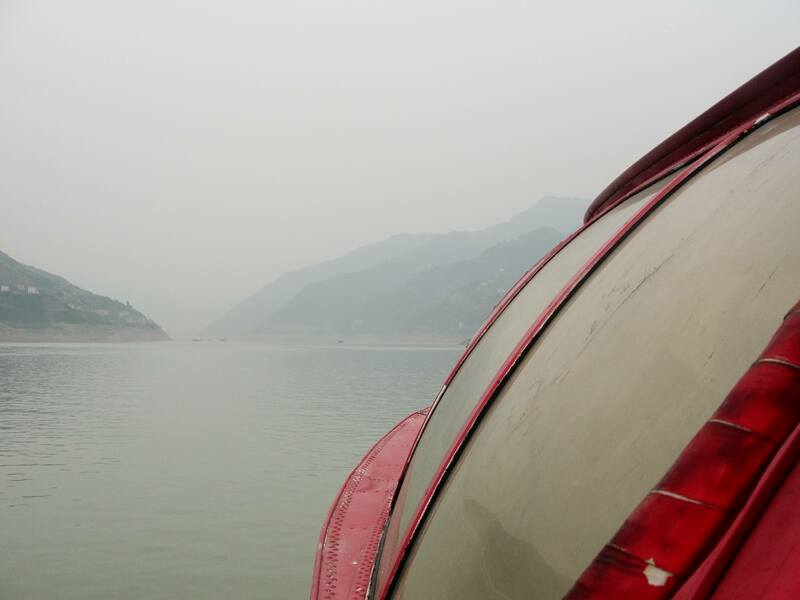 Apparently the best and cheapest way to start the Yangtze was to hop on a hydrofoil boat in this city called Fengjie. The boat drove through the gorges in the middle of the river until Yichang, home of the Three Gorges Dam, where the boat docked. A bus from Yichang could take me to Wuhan, which was the next big city I wanted to see after Chongqing. I probably had to do at least an overnight in one of those cities and had to buy my bus and boat tickets on the stop. So I left the Chongqing Yangtze River Hostel with this brief outline, my backpack, my phrasebook ready and the hope that I’d be able to cross half of the country successfully in a few days. (Success=don’t die). That’s pretty much the line between traveler and tourist. You’ve made it as a traveler if you’re days on the road are mostly spent NOT DYING. Good for you dude, you are no longer a tourist. Girl/boy guide (scout) badge to follow. The best part of my Yangtze adventure was the beginning, not the end. Im still not sure about the stuff in between. 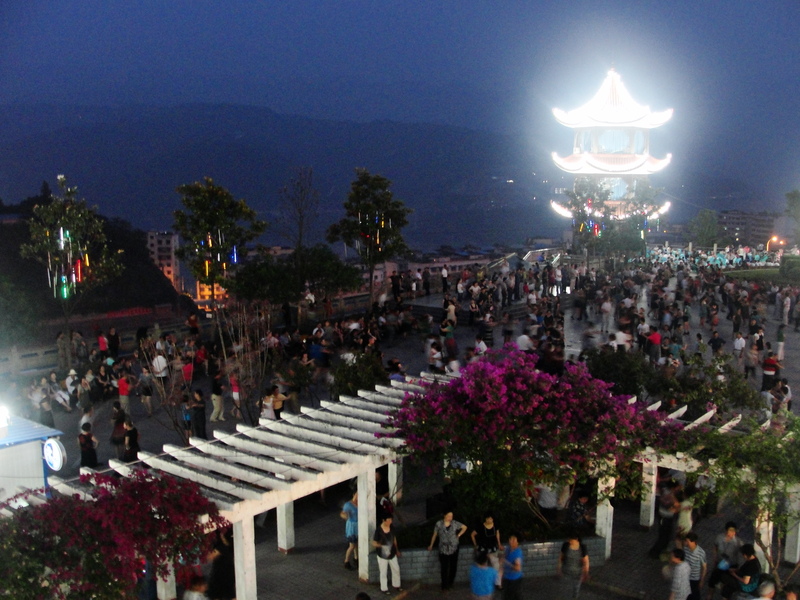 I would never have gotten the chance to see the town of Fengjie if I’d taken an organized tour of the Yangtze. Arriving in Fengjie I didn’t have a hotel booked, or any hotel names written down for that matter, so I was a little more anxious than usual getting off the bus and heading into the streets of a strange new town. Fengjie was one of the more chaotic places I’d seen thus far in China. Everyone seemed to be out on the dirty streets. Everyone stared. Everyone was doing something. Everyone had that rosy glow from being outside in a smoggy city all day. And everyone smiled. Even though I was offered a ride on the back of about a hundred different electric bikes I opted for a “taxi” to a hotel. I just said “take me to hotel please” in Mandarin and hoped that the town would provide. The place I was taken to was a little over my budget (instead of 10$/night it was 35), but the receptionist was pleasant and the breakfast was free, so I stayed. A three-hour wait in the muggy Chongqing bus station (it was June, I was in the middle of China; it was a miracle I didn’t melt) and a packed bus ride made me a little tired. But I stuck to my routine of checking in, plopping my backpack onto my new bed for the night, and setting out to explore the town. The sun was setting by the time I was on the main road. Families were strolling together and workers were settling down for a meal. I tried to wander down every side-street, stop to smell the BBQ at every food stand, and find a Fengjie flash mob. I found more epic dance parties than I did in Chongqing, met sweet restaurant owners I had trouble communicating with but who were thrilled with my being there anyway. Cute couples stopped in their tracks and waved shyly at the foreigner. Factory workers were doing shots of beer and beiju (Mainland clear liquor; basically paint thinner with Chinese characteristics) over BBQ. My favourite parts of Chinese culture all came together for me to see and experience in those few hours on the streets of Fengjie. The thing about China is that (in my opinion) while others sit back, analyze and wonder about their next move, China just does. They go and they do. And maybe we should be more like that, too.